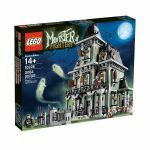 Detective Dr. Rodney Rathbone finds out that the ruler of the Monster Realm, Lord Vampyre, wants to turn day into night forever and wreak havoc with his monster army into the world of mortal minifigures. To succeed, Lord Vampyre must gather 6 magic moonstones and channel the magic of from these magic stones to begin the eclipse of the Sun forever. Dr. Rodney Rathbone has the moonstone treasure map drawn by his great-great-great-grandfig. He and his team of the Monster Fighters embark on a mission to prevent monsters from completing their evil plan!